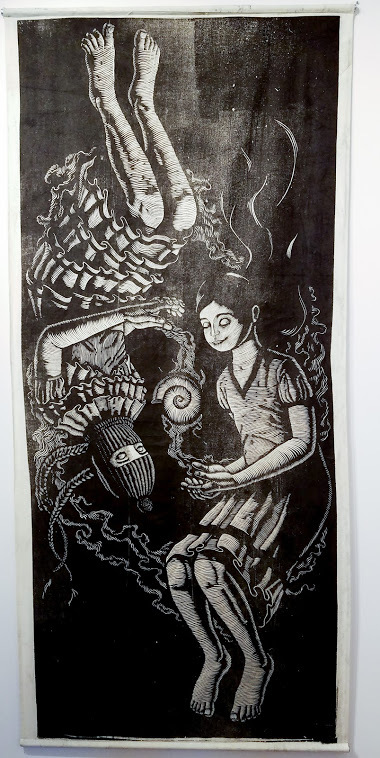 Image by Mazatl. 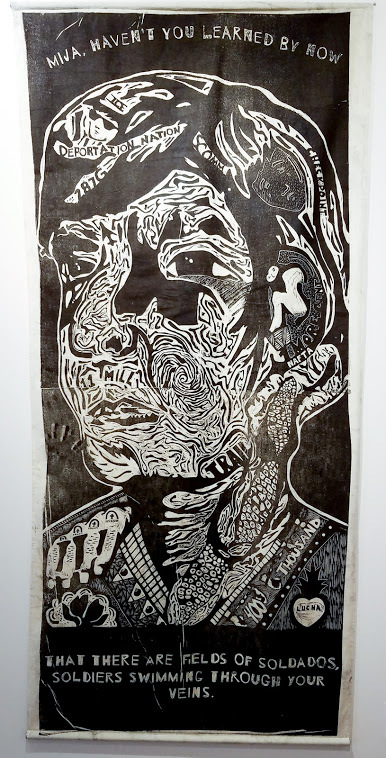 He is an activist and artist who lives in Mexico where he partakes in several collectives seeking social/political/environmental justice. 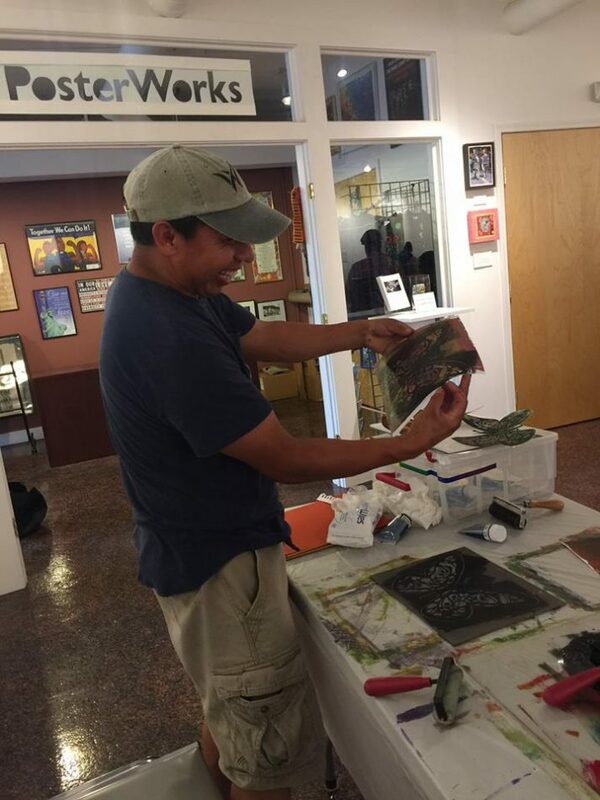 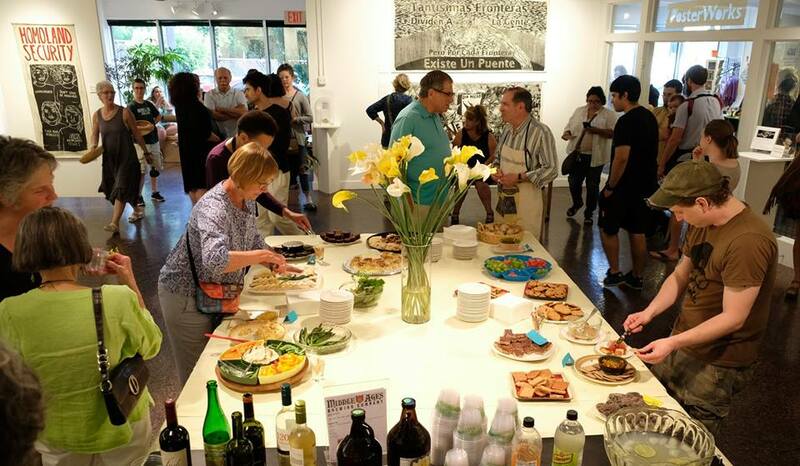 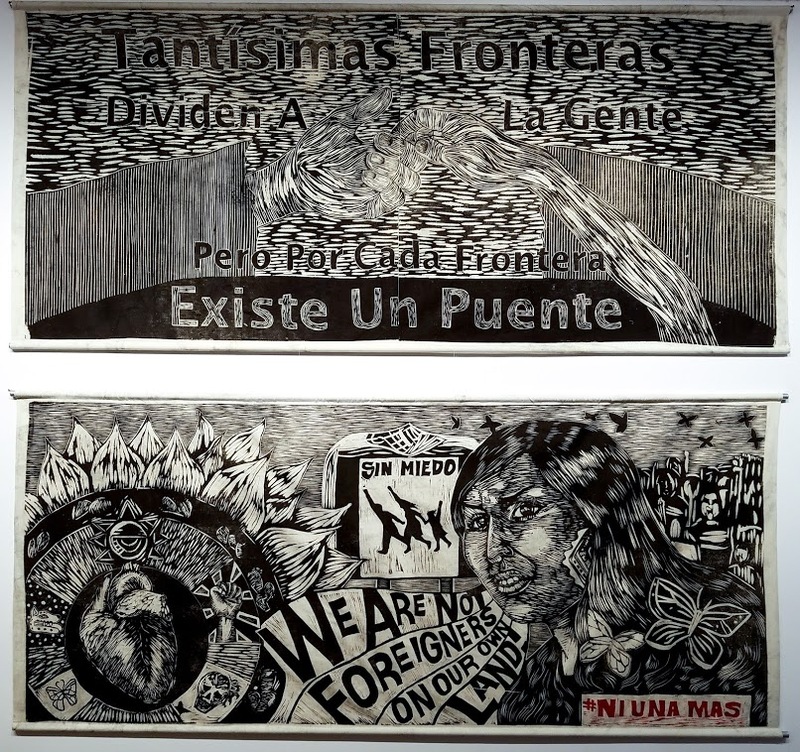 Fifteen artists of diverse immigrant backgrounds were invited to create large-scale woodcuts depicting images and messages inspired by their experiences as documented or undocumented citizens. 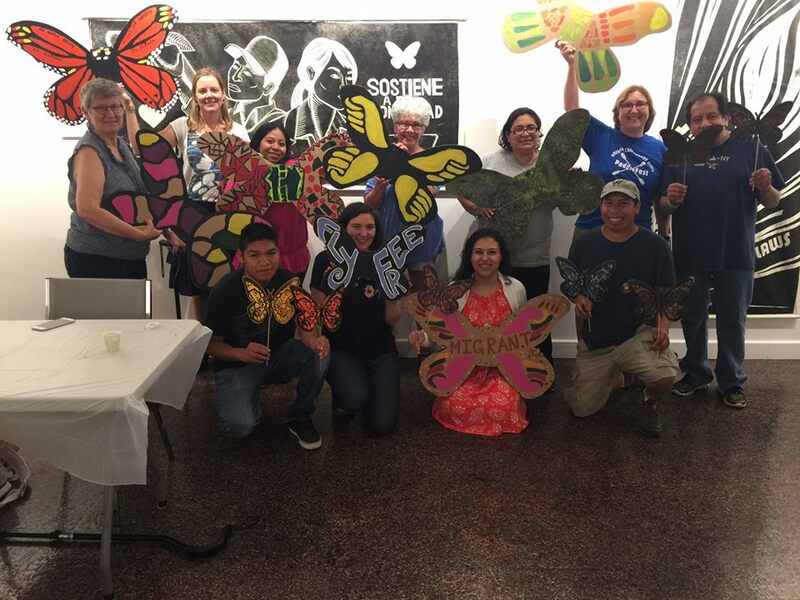 The themes explored deportation, justice, worker’s rights, the immigrant’s contributions to society and the freedom to move across borders. 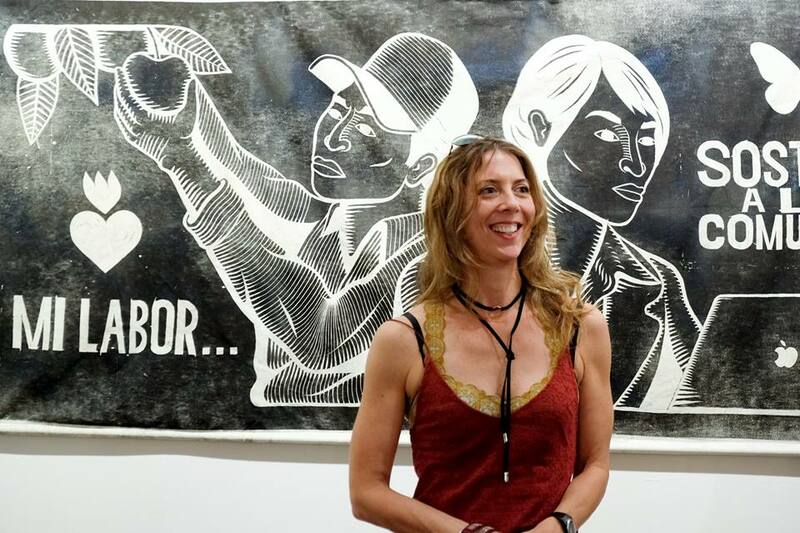 Artists worked for months carving their imagery into large wood panels, utilizing a printmaking process (some working in the medium for the very first time) that has a long history for disseminating information and rallying change. 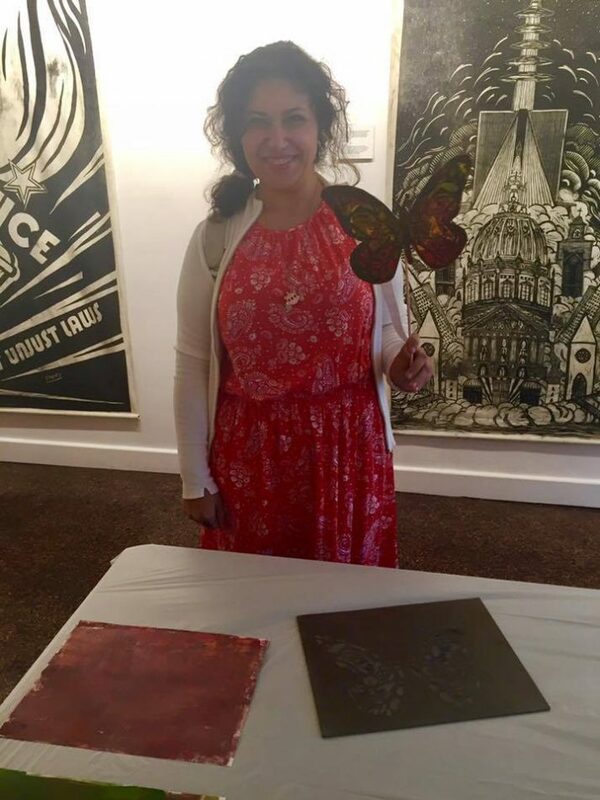 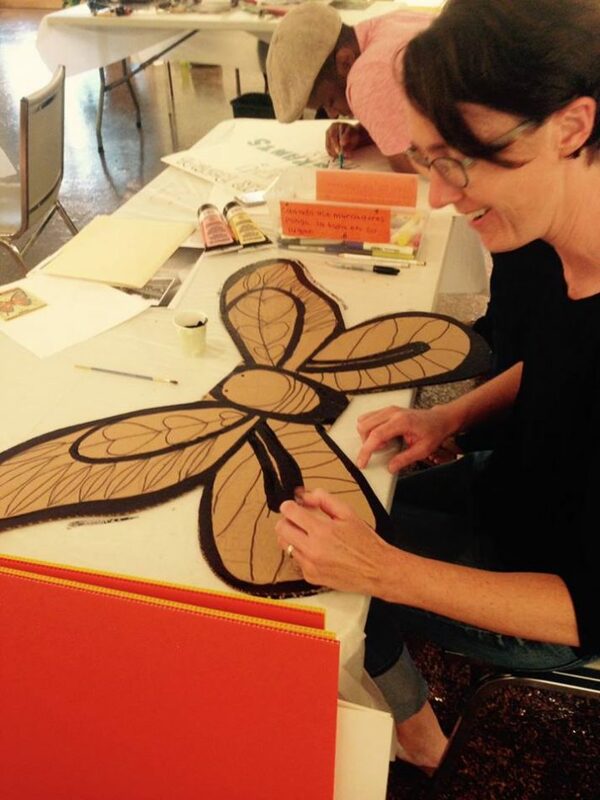 Professor Holly Greenberg and students from the Syracuse University printmaking program traveled to San Francisco in 2014 and set up a pop-up printmaking studio on the streets of the Mission District. 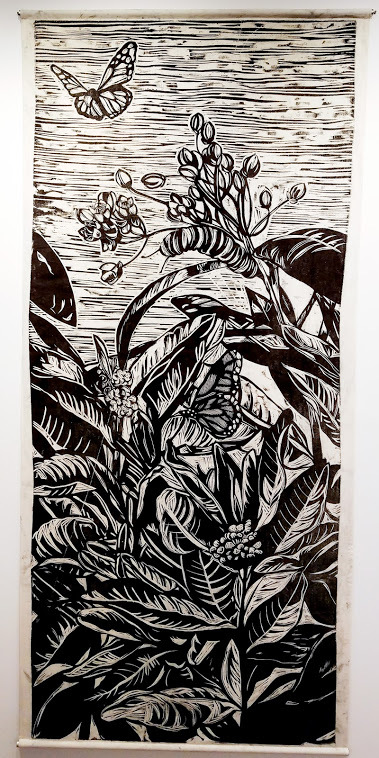 Working side by side, the students and artists printed the large-scale (7’x3′) woodcuts on fabric with a two-ton steamroller. 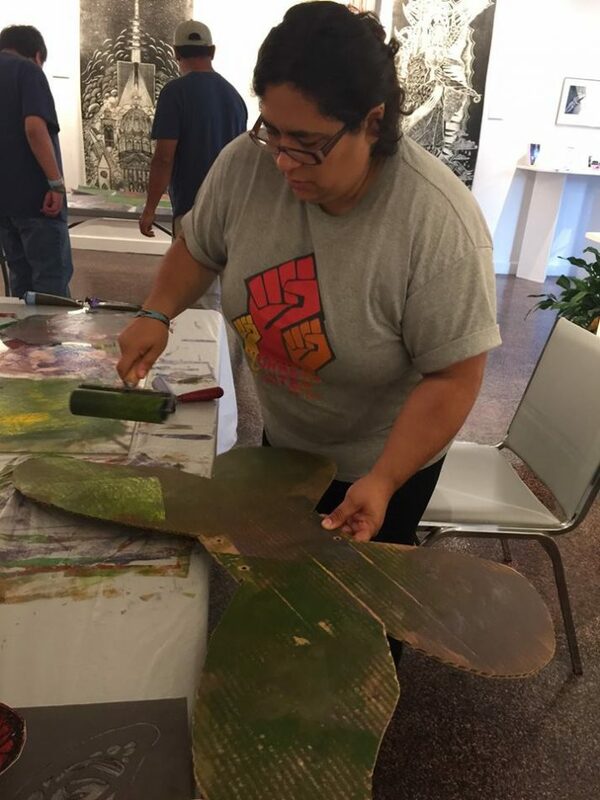 The resulting impressions are intended to be used as banners in political marches and protests across the United States where immigration policy change is currently challenged. 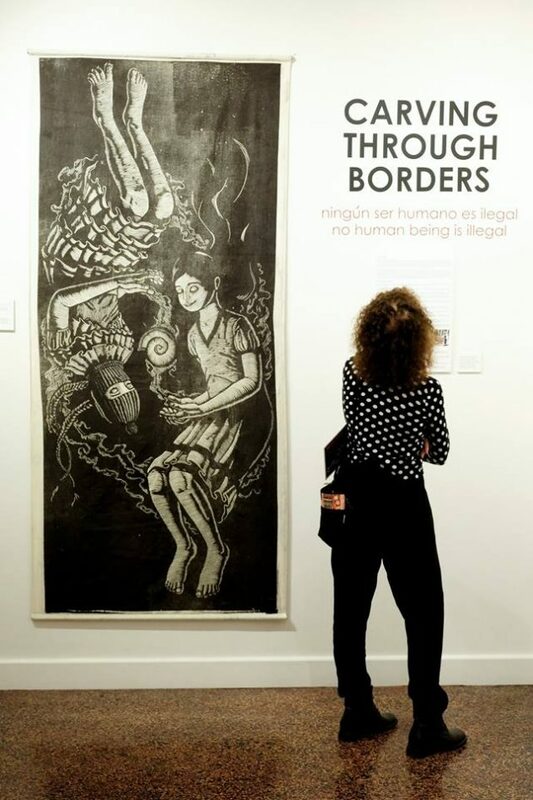 Carving Through Borders illustrated various aspects of migration—detention, deportation, displacement, discrimination—and also communities’ resistance and resilience. 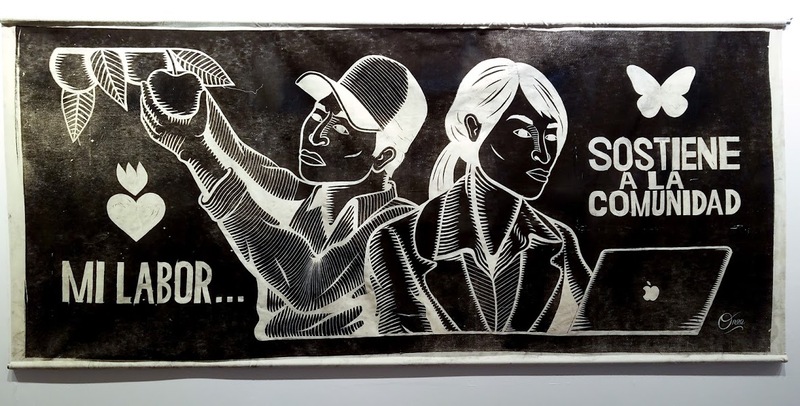 Exhibiting Artists: Agana – Oakland, Felipe Baeza – New York, Susalita Cortez – San Francisco, Emory Douglas – San Francisco, Rommy Enciso – Naples, FL., Crystal Galindo & Anesti Vega – Rohnert Park, CA., Chucha Marquez – Davis, CA., Mazatl – Mexico City, Carol Montes – Los Angeles, Oree Originol – Oakland, Favianna Rodriguez – Oakland, Julio Salgado – San Francisco, James Williams – San Francisco, Imin Yeh – Berkeley and Erin Yoshi – San Francisco. 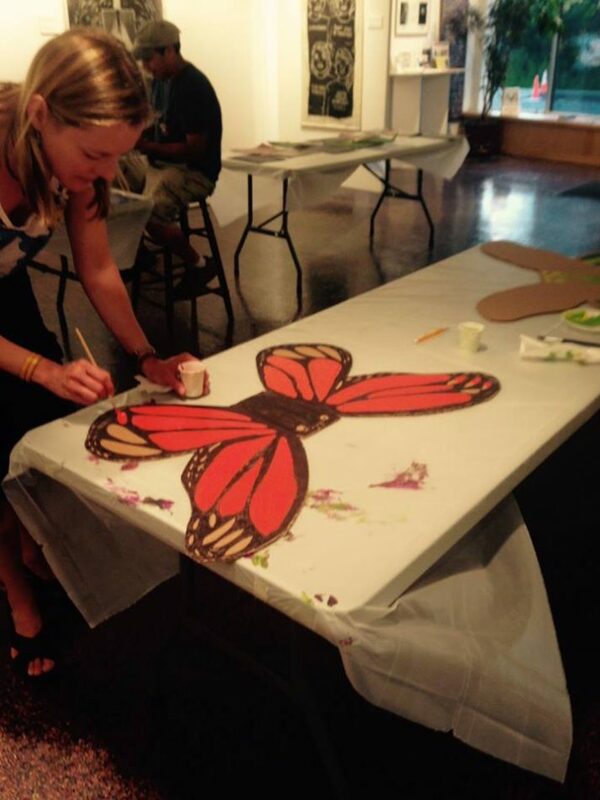 You can read more about the project on the CultureStrike web site.